When preparing this section it was very difficult to know where to begin or maybe more appropriately when to begin, that's the problem with history it is constantly being created. Most people will know about the Romans and the Normans but I wonder how many people will know that a castle (Rhyd y Gors) once stood within the boundaries of Llangunnor. No visible remains of this reputed wooden castle can be seen today as the expansion of the railway into Carmarthen with a station at Myrtle Hill (Carmarthen Junction) being opened on 17th September 1852, passing through the site destroying what evidence would have remained. 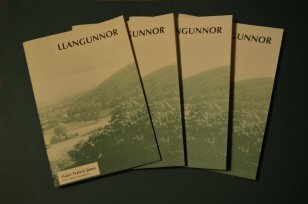 Of course others have looked into the history of Llangunnor and have published these findings which are valuable resources to any historian in fact it is down to these publications that the inspiration to create this online repository came about. In 1965 Major Francis Jones the County archivist for Carmarthenshire gave a lecture to Cymdeithas Sant Cynnwr (Society of St. Cynnwr) about the history of Llangunnor and the resources available to assist in the compilation of a full history of the parish of Llangunnor. The society felt that the end result of Major Francis Jones's research should be preserved and the end result is this book which was first published in 1965 and later republished in 1986. It contains a wealth of information about Llangunnor and since it was first published Llangunnor has seen a number of major changes which have altered the area considerably, with the construction of new housing estates from the mid 1960's and the destruction of Pensarn to make way for the bypass in the late 1970's we can already see that some of the places mentioned have faded from memory, however the book is a great starting point for further research into the parish. We shall be looking at the work of Cymdeithas Sant Cynnwr in more detail elsewhere on the site. 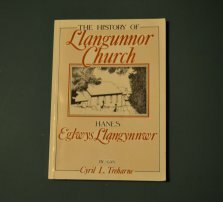 A comprehensive history of Llangunnor Church has been written by local resident Cyril Treharne which was published in 1989. 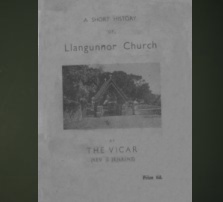 Mr Treharne had spent considerable amount of time looking through church and census records and the end result is the first book that gives a very detailed look at many different aspects of the history of Llangunnor church and those locals associated with it. The book looks at the memorials in the church and with a handy map gives information regarding the stained glass windows, and also looks at some of the interesting memorials which can be found on the gravestones in the churchyard. An extremely rare 28 paged paperback book which was written and published in 1937 by the incumbent vicar of Llangunnor at the time Reverend James Jenkins. Reverend Jenkins at time the book was published had been at Llangunnor for 25 years and continued to serve the parish until 1959 becoming the longest serving vicar of Llangunnor. The book briefly looks at the various aspects of the history of the church and the graveyard. Only a very basic overview of the history of Llangunnor, we will be looking at various aspects of the history of Llangunnor in the coming months and this section will expand eventually.